Wow! It is hard to believe that we have been in the Puhi Industrial Park, our original pie shop location for FOUR years! We are truly amazed each and every day for the support that our community has shown us! It is hard to believe that we now have TWO retail locations on Kauai! Kaua’i loves pie, what can we say! Stop in our Lihue, Puhi Industrial Park location today to show our original pie shop some loving before we move it across town to the Harbor Mall next week! We are VERY excited about our new Harbor Mall location! What we are not excited about is that the construction is not quite finished yet. Unfortunately, that means we will NOT have a Lihue Pie Shop location this week. We are hoping that we will be open after the July 4th Holidays, but still uncertain. Of course, our NEW Kalaheo The Right Slice pie shop is open for business as well as our usual community events…Waipa Market and Kukuiula Market. As we prepare to move our shop across town, we are also preparing to rehome our loving Pie Cats. Unfortunately, the mall is no place for our pie kitties, so we are looking for a loving outdoor home for them. If you would like to give our pie kitties a loving place to call home, please contact Baker Sandy at 808-212-5798. All three of our kitties are fixed. We treat them for fleas regularly and they are semi tame. They eat dry kitty food twice a day and cruise around filling in their diet with mice and birds. An ideal location would be a nice little area not near a main road where they can have a safe place to rest, but a nice area to roam and hunt. All three like to be petted lots, but are nervous when they first meet you. Please help us spread the word and help find these little lovers a new forever home! 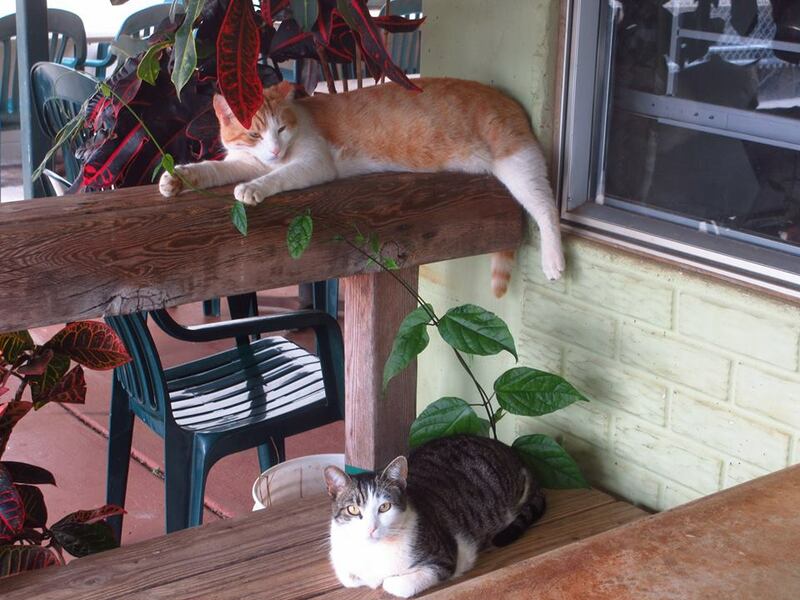 Here’s a cute pic of two of our bakery kitties, Boy and Sugar (Baker Sandy calls her Lil Mama)…lounging outside the bakery, just waiting for some attention.